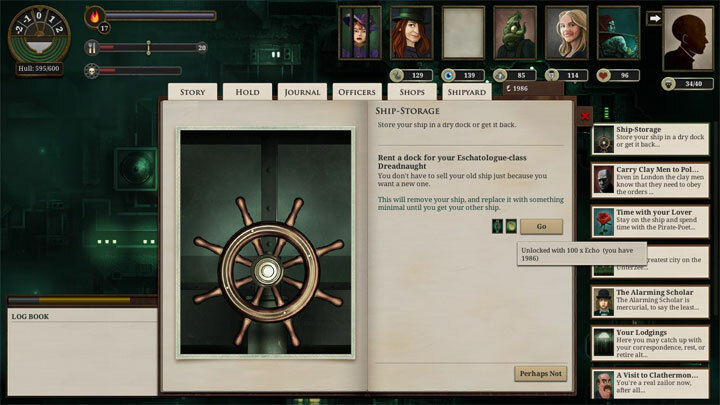 The file Ship-Storage v.1.1b is a modification for Sunless Sea, a(n) rpg game. Download for free. Ship-Storage is a mod for Sunless Sea, created by Dratoran. This mod adds an option to store your current ship and buy another one. After that you can switch in London between the ships without buying or selling either one. Version with modification of the story ship quests included. After changing your ship you'll now have a fully repaired ship and a full crew (instead of 1 hull and 4 crew as leftover from the Stymphalos-class Steam Launch. Furthermore I fixed a game breaking bug in version b (a missing comma -.-), but I still didn't test the modificated quests themselves. Do you want sometimes to change your ship without losing your current one? Maybe you want just a little more storage for your next trip to the surface, a smaller crew to make a detour to the Elder Continent or to simply try out a new style without losing your vessel permanently? Well, here comes the solution! You store (lose) your current ship and receive a token, which allows you to get your vessel back. In the mean time you get a Stymphalos-class Steam Launch, which is basically worthless. You can't sell them for echos and they only have 1 hull, but at least I increased their hold to 120 so you won't have to get rid of any cargo if you store your ship. From there you can either buy a new ship or pick up your old one. This version of the mod edits the events for the 'Leucothea-class Steam-Yacht' and the 'Cladery Heart' in a way that you won't receive the ship upon solving the quest but a token, which grants you the ability to get the particular vessel at the Ship-Storage. However, I didn't test it until now, so be careful using that version. It is possible to buy more than one ship of a single type, but there is no reason to do so since you can only use one. The Stymphalos-class Steam Launch has 120 storage places, but your new ship might not. If you change from a big ship to a smaller one then you should make sure to have not to much cargo. This mod limits the event "UNACCEPTABLE" (the clay workers "WE ARE CLAY" leave the ship, if you have a Stymphalos-class Steam Launch) to Zee / forbids them in harbors. Otherwise one would encounter a game breaking bug, if one changes between ships too fast. Go to the game folder in your AppData. The path is usually 'C:\Users\[Your Username]\AppData\LocalLow\Failbetter Games\Sunless Sea\addon'. Place the Ship-Storage folder (the one containing 'entities') in 'addon'.